I would not describe myself as a neat person. I like when things are put away, but my default is leaving items where they land until I decide it is overwhelming. This has become problematic in my current apartment. 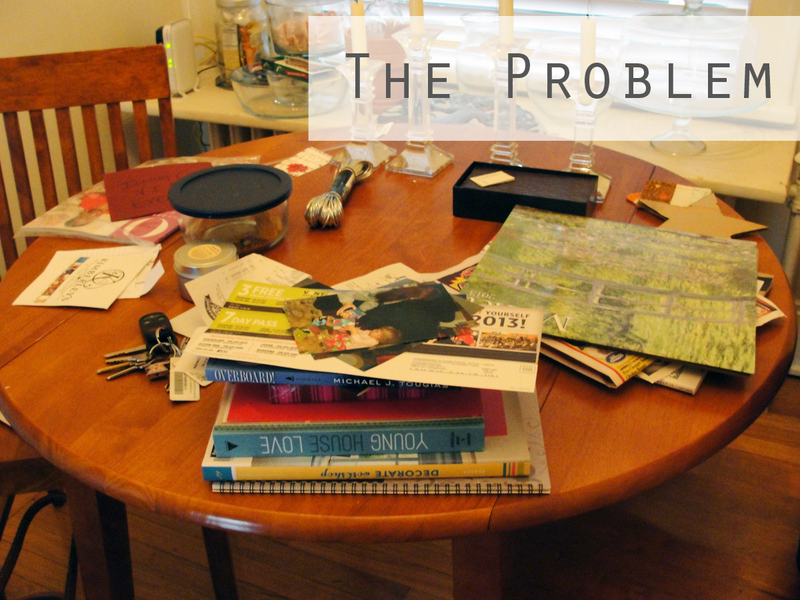 The first room you enter is the dining area, and all my mail and papers accumulate on the table. Then I don’t end up eating at the table because there’s all this stuff covering it! I am in the process of rearranging my desk area in the living room, and I decided to make some upright storage to deal with incoming paper. I didn’t want to spend money on something that I might not use in 3 months, so I didn’t make a single purchase for this project. 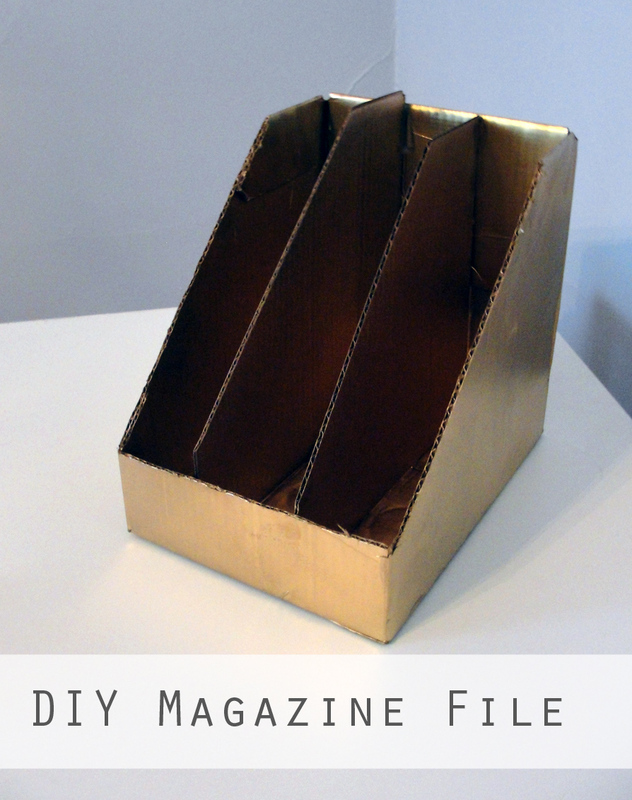 All I needed to make a magazine file was: two cardboard boxes from 12 packs of beer, and some spray paint. I selected the nicer looking box for a main part and cut out a triangle shape from each side. The shape started 3 inches from the top left edge, and 2.5 inches from the bottom right edge. I connected those marks and cut out the portion. 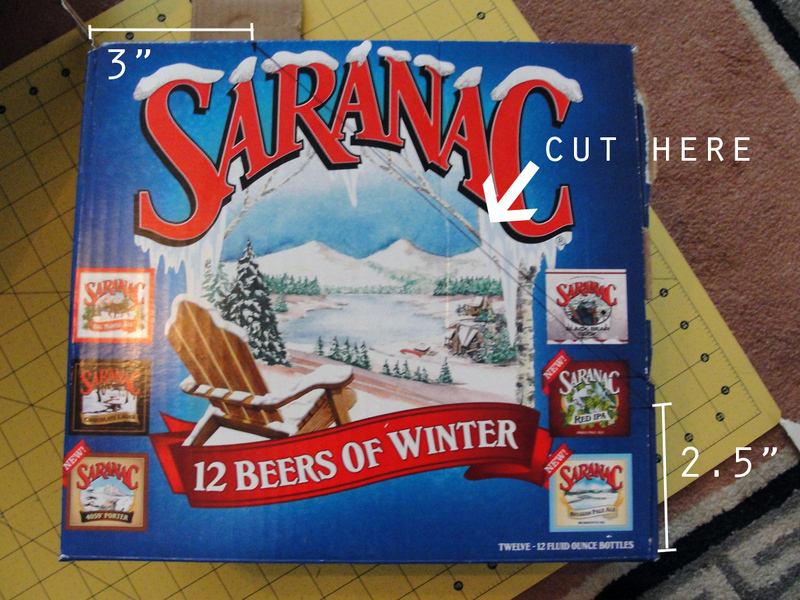 To complete the cutout, you’ll have to cut 2.5 inches from the bottom of one side of your cubic box. For the top, I folded part of it inside to add extra structural integrity. I cut two more of this same shape (the square with a corner missing) from the extra box. These pieces are going to be used as dividers. 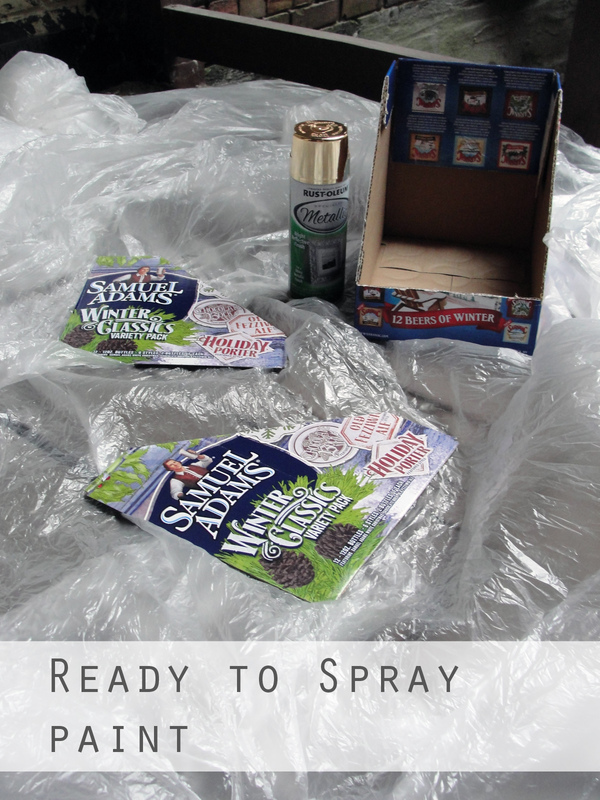 Once I had all of the right shapes, I took them outside to spray paint. I only had gold paint on hand, so that’s what I used! The next day, I used hot glue along the inside edges of the inner pieces to make a divider. 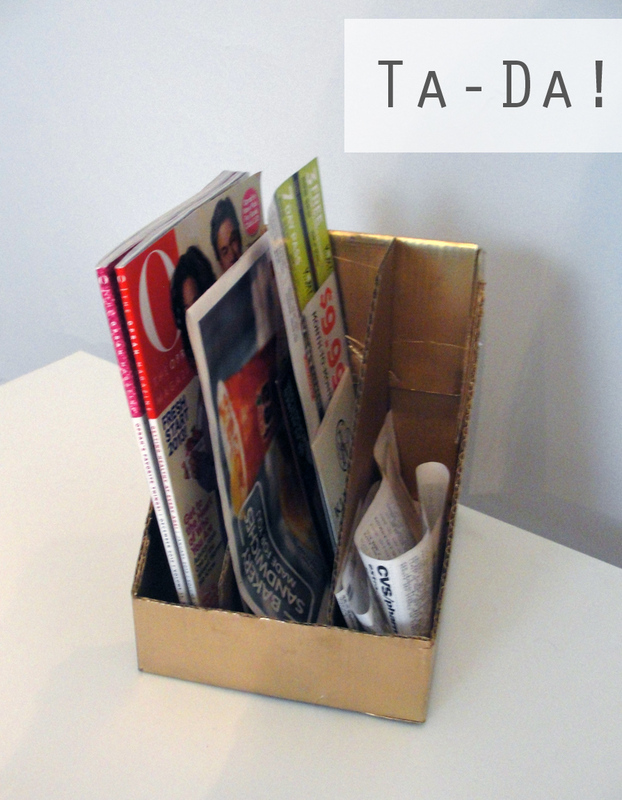 Now you have a cardboard magazine rack for no cost and just an hour or so of work! 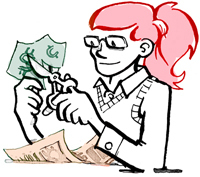 I have begun sorting my mail into the three dividers: magazines, coupons/gift cards, and receipts to log with bills. Even though I have to finish clearing the table, it already looks so much better. 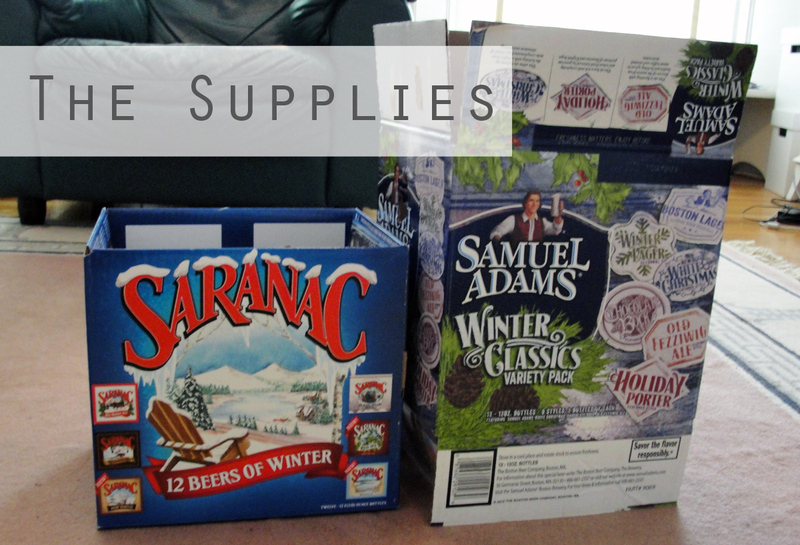 You have simultaneously made me want a beer and a new thrifty project to do. Thank you! I was worried I would seem like too much of a lush with extra boxes, but oh well!